So a week later, we went down to Webster Hall and my DJ partner at the time, Etienne, and I were set up to play a short set in what is now the pizza stand near the sports bar. The pizza stand was our DJ booth. Yup! Still laugh thinking of that. We had so much fun that night and continued to spin there several times after that, bringing our friends down to party with us. I still remember that night. It was surreal in many ways. Opening up on the main floor in a landmark venue of the city I grew up in. A city where I used to dance and party until the sun came up and I was squinting in the bright sunlight, listening to the tunes of so many legendary DJs who made their homes in this city. I did my half hour set on the main stage and felt high as a kite throughout and for quite a while after it was over. A couple of months later, Etienne became the main DJ and I became the opener. There were no headliners back then. The VIP section was literally on the main floor, cordoned off with the usual velvet ropes. Couches lined the outskirts of the main floor surrounding the vibrating dance floor from feet stomping on it through the night. It took some time to actually sink in that I was now a regular on the main floor of Webster Hall. Flash forward a few months and a new resident, Dennis Amadeus Ivanoff, was brought in but I was kept by Kenny and the club as the opening act. Some time had passed and one day I approached Kenny in the office and talked to him about some promotional ideas my friend Tengo and I had for the club. Kenny loved the ideas we pitched to him and told us to go ahead with them, as well as making us the new resident DJs for Webster’s main floor on Saturday nights. Not too long after that, we were told of a new party coming up called Circus run by Shane Savant, which we became a part of. It truly was an incredible concept which ran for a few years, not that easy to pull off in an ever-evolving NYC club scene. I loved what I was doing and couldn’t wait for Saturdays to come around, every single week. After Circus had run its course, I was told that we were again changing the Saturday night format to a party called “Brite Nites,” for which Area Event members Brian Artica and John Dimatteo teamed up with Kenny to shift to a more headliner-based concept. It was somewhat bittersweet for me as I had been a headliner for some time and I had to go back to opening on many nights. However, because of this, I got to open for many internationally renowned artists such as Axwell, Kaskade, A-Trak, Tiësto, Deadmau5, and many, much, more, whom I had the pleasure of meeting and spinning with. The DJ setup was moved from the corner of the stage to the center, along with some insane lights and effects, making the artist the focal point, projecting the vibes into the jumping crowd. If you ever came to a Brite Nites event, you need no explanation. It was a spectacle the likes of which NYC hadn’t seen in quite some time, taking the city by storm. 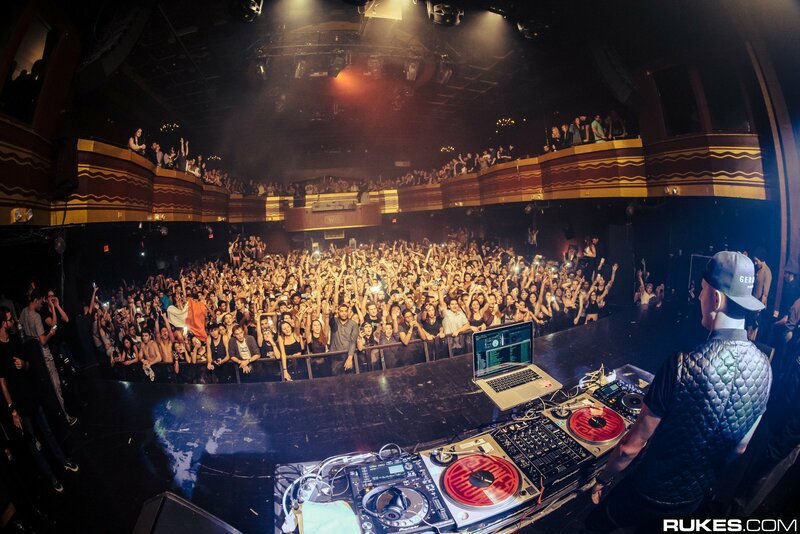 It was one of the most viral, electric and incredible parties to hit the NYC nightlife scene. The energy was insane and not easy to fully describe if you weren’t there. On a somber note, I couldn’t write this without mentioning Jess Marquis – may he rest in peace. When I met him, Jess was running a party called Trash. He later became my partner for Brite Nites. We complimented each other’s energy and tastes so well and kept the crowds crazy. If you saw Jess spin, you couldn’t forget the energy he brought to the stage. He was as much a partier himself on the stage as he was a DJ. You could tell that often he wanted to just run onto the floor to join in the celebration and not simply spin the tunes but alas, he had to spin so others could dance. He was one of the grandest people I’ve ever met. His untimely passing devastated those of us who worked with him and came to know him at our club. He was and is sorely missed by so many who knew him. I still miss him. It was extremely difficult to continue to work after his passing, to be back on that stage without him there. You could tell that often he wanted to just run onto the floor to join in the celebration and not simply spin the tunes but alas, he had to spin so others could dance. He was one of the grandest people I’ve ever met. His untimely passing devastated those of us who worked with him and came to know him at our club. He was and is sorely missed by so many who knew him. I still miss him. It was extremely difficult to continue to work after his passing, to be back on that stage without him there. He was as much a partier himself on the stage as he was a DJ. You could tell that often he wanted to just run onto the floor to join in the celebration and not simply spin the tunes but alas, he had to spin so others could dance. He was one of the grandest people I’ve ever met. His untimely passing devastated those of us who worked with him and came to know him at our club. He was and is sorely missed by so many who knew him. I still miss him. It was extremely difficult to continue to work after his passing, to be back on that stage without him there. Flash forward to this past weekend and all these years come flooding back. So many memories, people, friends, crowds, colleagues, co-workers, happiness, and tragedies – such a long time yet it all seems like it happened in a blink of an eye. It still hasn’t sunk in yet, I think. The fact that Webster Hall is actually closing its doors. I feel so lucky and honored to have been a part of this NYC landmark venue and to have been a part of the final club night at Webster, headlined by Skrillex with my fellow Webster Hall DJs, Alex English, Dali, Hayawatha, Tjani and Dischetto, DLO, Sean Sharp, Shaka Sean, Suga Ray, Chris Landry, Rayrok, Steve Sims, Rekles, Subset, Katnip. A very deep thank you to Kenny for taking a chance on me and giving me almost a decade in the longest running and best nightclub/venue in our great city. I’m beyond grateful to him. Also Heath Miller along with Kenny for bringing countless incredible artists to the venue. Special thanks to Gerard and John for being the best GMs in the business and Brian for helping me evolve and grow in this business. I still remember talking to Brian for almost a year nightly on the phone, guiding the promotional aspect of the parties. I finally see him in person in my DJ booth one night for the first time. lol. I continue to be very close friends with Brian to this day. And, of course, the BALLINGER family for giving everyone this gift for almost three decades. If I left anyone out, please forgive me as it was not intentional. I wish you all well. I will miss Webster Hall dearly and will miss all the people I’ve met there even more. I’ll cherish all the memories and our moment in time forever. On behalf of all the staff at ONE EDM, thank you for some of the most memorable parties at the Greatest Nightclub On Earth.